Speaking about his new appointment, Bishop-Elect Harris said, ‘I’m very conscious that the Diocese of Townsville has been without a bishop for three years. It has been on all of our minds. If the bishop is a sign of unity, which he is, I hope that I can strengthen the unity of the vast Diocese of Townsville and build on the work of Bishop Michael Putney and, since his death, on the efforts of Diocesan Administrator, Fr Mick Lowcock, the Parish Priest of Mount Isa. Welcoming the new appointment, Archbishop Denis Hart, President of the Australian Catholic Bishops Conference said, ‘Together with the bishops of Australia, priests and people of Townsville, I welcome the announcement of Fr Timothy Harris as Bishop of Townsville. Fr Tim is a fine priest and has been a wonderful pastor in a large parish. I rejoice with the people of Townsville as they prepare to welcome their new shepherd who will serve with renowned generosity’. Born in Brisbane on 29 October 1962, Bishop-Elect Harris received his primary education at Nundah Convent and Virginia State School and secondary education at St Joseph’s Nudgee College. Joining the Bank of New South Wales, he worked in public relations for five years. In 1991, Bishop-Elect Harris graduated with a Bachelor of Theology. After priestly formation at Pius XII Provincial Seminary in Banyo, Brisbane, he was ordained a Deacon on 5 June 1992 and ordained a Priest on 18 November 1992. During his priestly ministry, the Bishop-Elect served as Associate Pastor in the parishes of Grovely and Caboolture, and as Parish Priest in Corinda Graceville (1996-2010) and Surfers Paradise (2010-2017). 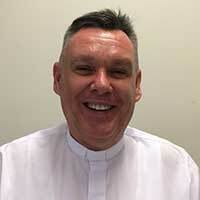 He has also served the Archdiocese of Brisbane as the Dean of Western Deanery and the South Coast Deanery, as Chair of the Taskforce for Pastoral Planning, and as a Member of Personnel Board, the Clergy Appointment Advisory Board and the Council of Priests. The Office of Bishop has been vacant in the Diocese of Townsville since the death of Bishop Michael Putney on 28 March 2014. The date of Bishop-Elect Harris’ Episcopal Ordination will be announced soon.